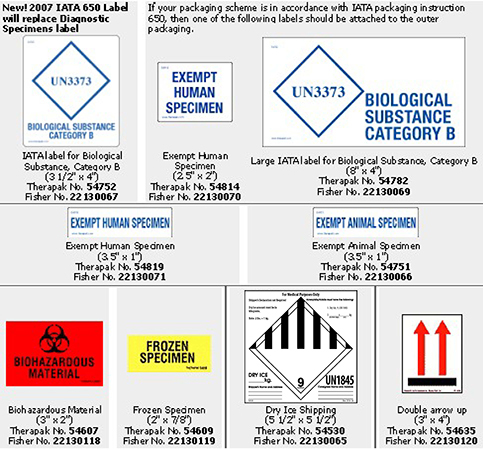 Depending on the type of packaging selected to transport Biological Specimens, there are mandatory markings that must appear on the outer packaging according to DOT and IATA regulations. Please refer to IATA Packing Instruction 650 for more details. Please consult your Therapak representative if you have any questions about the required markings. In accordance with current IATA Chapter 17 revised regulations for temperature sensitive products, this package marking label is required by the TTTF (IATA – Time & Temperature Sensitive Task Force) effective July 1, 2012. In an effort to develop minimum standards for the air transport and handling of time and temperature sensitive products, it is the responsibility of the shipper to apply the time and temperature sensitive product label to the outer packaging visible to package handlers. The marking label must be affixed to at least one side panel of each individual package. The lower half of the label may be used to indicate the transport temperature (allowable temperature range) in Celsius designation and in English. If you do not know the transport temperature range, the lower half of the label should be left blank. 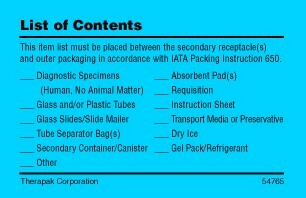 IATA Packing Instruction 650 requires “an itemized list of contents” card as part of the packaging instruction. This card should be placed between the secondary packaging and the outer packaging. Therapak’s standardized list of contents card is available in any printed quantity requested. Customization available on request. Stock card size is 4.25 x 2.75”.